Chrontendo: Chrontendo Episode 8 Has Been Released! Chrontendo Episode 8 Has Been Released! Chrontendo soldiers onwards in its quest to play every Famicom/NES game ever made. By now we have reached April and May of 1986, and this episode features yet another historic moment, with the release of Dragon Quest by Enix on May 26th. While not particularly successful in the US, Dragon Quest would become one of the most popular franchises in Japan, almost single-handedly launching the Japanese RPG genre. While DQ is in some ways a flawed, uneven game, its importance to the Japanese gaming world cannot be overstated. This episode also includes a (very) brief history of RPGs prior to the release of DQ. However, I also feel that the release of Dragon Quest is significant in another way. For the first year or so of its existence, the Famicom mostly played host to games that were either ports of arcade or computer titles, or very simple sports games. By the end of 1986, the Famicom will have been transformed into a very different beast. Many of the titles released for the Famicom in the future will belong to newer, more console-based genres, that didn't have an exact counterpart in the arcades or on computers. I'd say the Famicom established or popularized four console-based genres: Side-scrolling platformers, Zelda-esque action adventure games, Japanese text adventure games, and Japanese RPGs. The actual games that served as a model for these four genres are: Super Mario Bros, The Legend of Zelda, Portopia Renzoku Satsujin Jiken, and Dragon Quest. In other words the basic blueprint for the Famicom's existence has now been laid out. Expect to see those four formulas used over and over again for the next seven years. Duh. What else could it be? While there had been several prior RPGs released in Japan for the PC-88 and MSX computers (Dragon Slayer, Black Onyx, Hydlide), it was DQ that really laid down the rules for Japanese RPGs. 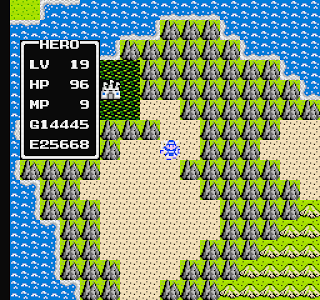 The basic gameplay and plot of DQ was derived from Richard Garriot's Ultima III: Exodus, yet DQ manages to feel completely different than existing American RPG video games. Yuji Horii, Akira Toriyama and Chunsoft manage to create a game that would appeal to the typical Japanese anime fan, rather than the 16-sided die crowd. Their effort paid off: Dragon Quest would sell a million and a half copies, and future entries in the series would rack up even more impressive sales. No, this is not THAT Super Mario Bros. 2. 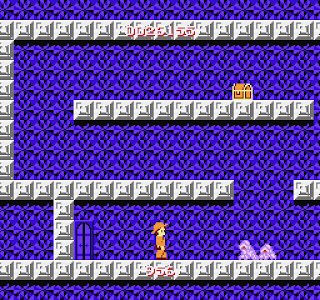 This is the original SMB 2, which is virtually a remake of the SMB with the difficulty ratcheted up a few notches. For some reason, Nintendo choose not to release this game in the West for several years, until it eventually made an appearance as "Super Mario Bros.: The Lost Levels" for the SNES. Konami bats one out of the park with this stellar port of their 1985 arcade classic. Konami seem to have ported this themselves rather than relying on an outside developer, as Capcom has been doing up to this point. The results are the best shoot-em-up for the Famicom released so far. Nintendo's overdue second game for the Famicom Disk System. While not in the same class as Zelda (and also not designed by Shigeru Miyamoto), Nazo no Murasame Shiro is a nice little action adventure title featuring a samurai. Imagine a more linear Zelda consisting of only the dungeons without the overworld. Tecmo makes its first, unsteady steps towards platforming greatness with this unusual title. 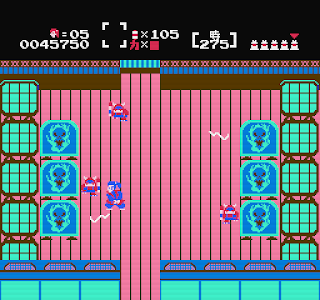 A Famicom-only sequel the the arcade's Bomb Jack, this title is a side-scrolling (and vertical-scrolling!) platformer that takes place inside a pyramid and is really the first decent SMB inspired game. Mighty Bomb Jack, like Tower of Druaga, is a little too difficult to be completely enjoyable, but it is a fine early effort from the folks who would later release Ninja Gaiden. Ugh. This hideous mess from Sunsoft resembles Pitfall meets SMB, plus controls that handle like an 18-wheeler on an icy mountain road. Amazingly, this was considered for an American release as Super Pitfall II. While that seems somehow appropriate, please be aware that this game is actually much worse that Super Pitfall (which will be covered in Chrontendo Episode 10, by the way!). You might be able to make an interesting game based on this idea: you are a mother bird feeding her chicks and avoiding predators. Regrettably, Bird Week is not an interesting game, but rather one that feels short on inspiration and detail. A dull, repetitive action game. Addtionally, Episode 8 contains several games which are definitely not good, but not bad enough to actually hate: Gegege no Kitaro, Argus, and Tag Team Pro Wrestling. Also this episode: Kage no Densetsu, Seicross, Spy VS Spy, Dig Dug II, and Sansuu 1,2 & 3 Toshi: Keisan Game. Chrontendo Episode 8 is available to download or stream here. Not a bad game if they ever try to bring it out for the Virtual Console someday here (seem Japan got it already for their VC a couple years ago). Mighty Bomb Jack was released for the NES as well, so it's not a Famicom-only sequel. I never knew this game was a sequel, so maybe the original Bomb Jack was a Famicom only release? Why do you keep saying "Temco" instead of "Tecmo"? Chrontendo Episode 7 Available to Download!